Wally Carter's been murdered. Shot dead in his backyard. The people with the motive to kill Wally are numerous. The Russian Prince in love with his wife, the disgruntled brother of his pregnant lover, or his angry wife; the list is endless. But they all have alibis and Wally's end is a head scratcher for the local authorities of this small English village. Enter Inspector Hemingway from Scotland Yard. He's been around his fair share of murder cases but even he's stumped. Every lead comes to a dead end. One way or the other, the Inspector will get his man- or woman. 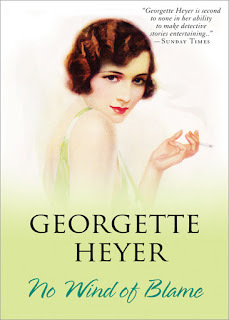 No Wind of Blame by Georgette Heyer is my first Heyer mystery. Unlike her Regency or historical novels, No Wind of Blame is contemporary- for Heyer that is, written in 1939. No Wind of Blame is not just a mystery; it's funny and entertaining. The characters are quirky and the dialogue witty. Retired actress Ermyntrude (how's that for a handle?) is the epitome of the word diva, with her hysterics and drama. Her daughter Vicky is following in her footsteps. She never enters a 'scene' without being in character, complete with the appropriate costume. Mary is the straight man in this comedy trying to wrangle the characters together and make them act sensibly. The women are the stars of this story, even Inspector Hemingway takes a backseat to the ladies. As for Inspector Hemingway, we know he'll solve the case, of course, but although I suspected the who, the how surprised me. Everyone had a reason to kill Wally; he wasn't a well loved guy. The Inspector is never fazed. He knows that there is much that the suspects aren't telling. The evidence will solve the case. If you enjoy mystery, humour and a pinch of romance, you'll be entertained by No Wind of Blame. Thanks to Sourcebooks for this review copy. I didn't know Heyer did mysteries - I've avoided her work because I thought she was strictly a romance author. This one sounds like something I might like. Okay, this is going on my brand new mystery wishlist! This sounds good. And I love the cover! I have only read one Heyer mystery, but I do mean to read more in due course! Lola- It is pretty,isn't it? J.S.- Hope you like her. Bluestocking- This is my first. Kathy- She wrote quite a few. Marg- I'll have to read more now too. Ermyntrude? Really??? It sounds like a good book, but it'd be worth reading for the name alone! I've never read one of Heyer's mysteries, but this sounds like fun!